Jill now has a beautiful store front shop in Old Town Pasadena. One of a kind ceramic spoons for that special someone. 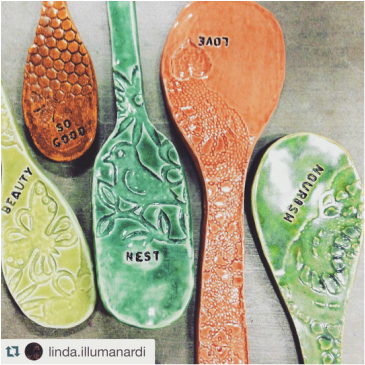 Made with love by Altadena artist, Linda Illuminardi. Textured and stamped exclusively for Homage. We love supporting local craftspeople. For over 20 years, Wasabi Jewelry has been a labor of love for designerJill Pearson. More than just a line of semi-precious jewelry, Wasabi is handmade with extreme attention to detail by loyal craftspeople who work exclusively for Jill. Dedication to quality is as important as the design and every piece that leaves the studio has been inspected by highly trained eyes. In 5th grade, Jill, her sister and a friend made jewelry and sold it door to door in the Valley. You could say that was the beginning. Many years and many adventures later, she started Wasabi with a line of freshwater pearl necklaces adorned with sterling silver pendants, charms and lockets. To this day, Wasabi is still known as a go-to line for pearl jewelry ranging from simple classics to more edgy, fashion forward pieces using materials such as leather and brass mixed with antiqued chains and other unexpected materials. She continues to sell to retailers that have bought the line since she introduced her first collection in New York and wholesales through reps on both coasts. In 2005, while chairing a benefit with a 1950's theme, Jill's love of vintage jewelry was cultivated. Vintage rhinestone brooches and other mid-century jewelry pieces were bought and re-sold to patrons and the leftover inventory was the start of Re-Purposed Vintage by Jill Pearson. "I love vintage jewelry, but I'm not necessarily a purist. I look for great examples of period jewelry or unique charms and doo-dads that can be transformed into more relevant, contemporary pieces that can be worn by anyone. Of course, something that is marked and rare, like an amazing Weiss brooch or Miriam Haskell necklace remains intact and admired in my collection." This passion for re-purposing vintage continues and is fueled by the thrill of the hunt and the satisfaction of creating a one-of-a-kind piece. 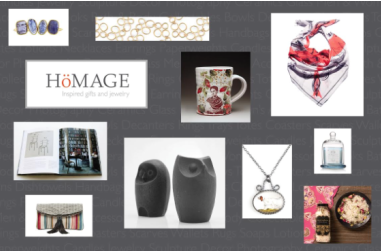 Wasabi is honored to be carried in some of the best specialty boutiques and galleries in the country as well as prestigious catalogs and museum stores. For a complete list, please see "Where To Find", coming soon. Currently Jill resides in an updated mid-century home in Pasadena with her husband, Bill, an independent retail consultant and their daughter, Samantha, an aspiring writer and singer.